Can you advise me on first word books for my baby? Can I read to my 3 month old? Should I let my child play with/break the books? What book should I read as part of a bedtime routine? Robin wakes one Autumn Day to find a flurry of activity; the finches are getting ready to fly south and Squirrel is burying his nuts. Winter is coming and everyone is preparing. Robin thinks ‘Winter’ must be very scary. After snuggling up to Bear in his cave Robin wakes to find a magical transformation, snow has fallen, winter has arrived and it isn’t scary at all. He has lots of fun with the other creatures until signs of spring arrive and he realises more exciting changes are in store. 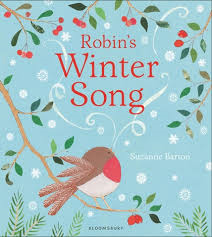 This is an appealing and beautifully illustrated picturebook which explores the magic of the seasons through the eyes of a young robin experiencing his first winter. There is plenty to talk about in the illustrations and lots to learn about animals too. Bear’s ‘one sleep’ till winter is over for example, is an interesting introduction to hibernation. Sharing this story as the seasons change will give lots of opportunity for children and parents to observe changes together and talk about what they see in the natural world. Before you start reading talk about the cover image together. Has your child seen a robin in a garden or park? 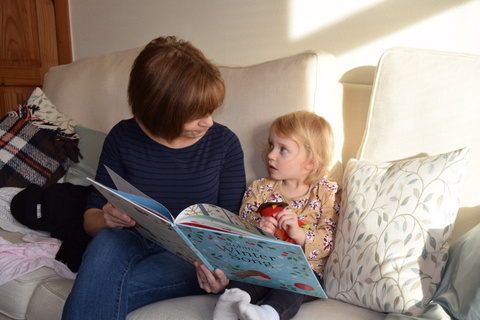 Read the story aloud to your child pausing to talk about the illustrations and what is happening when your child wants to. Children could retell the story using the illustrations to guide them. Make a robin finger puppet together that they can use to help them tell the story. Talk about robin’s feelings eg when all the birds fly south. Make a robin finger puppet together from felt or paper and pens. Click here to see how. Children could hold the puppet while you read the story and when they retell it. Cut a hole in the lid of a shoe box. Find some tissue paper or newspaper so that your child can make a comfy bed for a small teddy. Children can play the part of the story when robin follows bear and joins him for his winter sleep. Go for a walk in a park or the woods and look out for signs of autumn, winter or spring. In autumn or winter you could make a collection of leaves, acorns, and conkers or fir cones. Make a when you get home and write labels together. 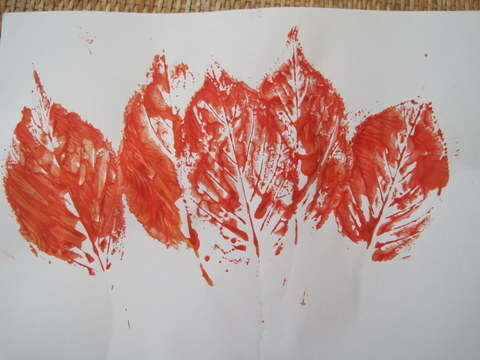 Collect autumn leaves and make leaf prints. You will need paint and paper. 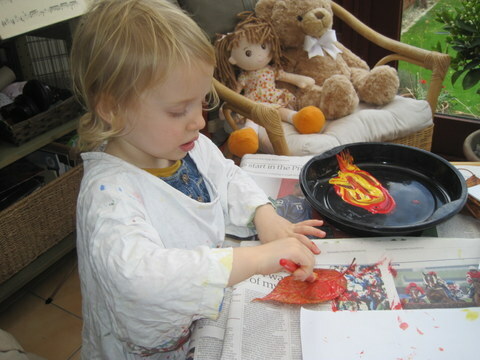 You could also make sponge prints of birds and decorate with collage paper wings when dry. Look at the illustrations of snowflakes. Make a snowflake picture or Christmas card together. 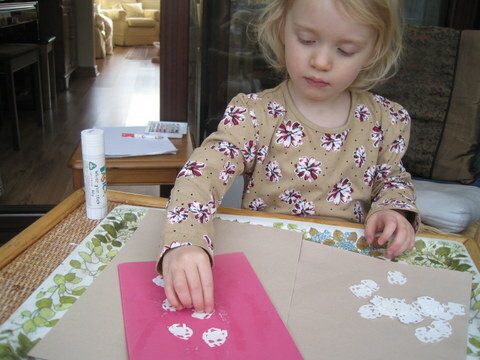 For younger children you could cut small pieces from doilies to stick. Older children could make their own snowflakes with circles of white paper folded into quarters or eighths and snipped. You will need coloured paper or card, a glue stick and white paper or doilies. Sign-up for our newsletter for updates on our brilliant books and fun activities for parents and children. 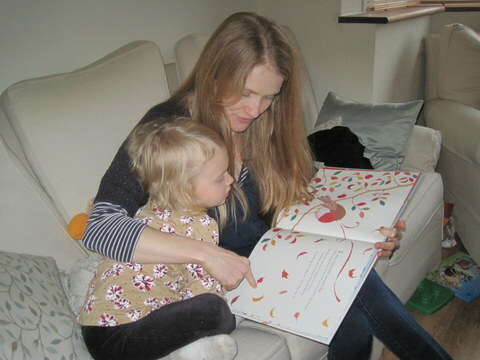 With lovemybooks you will find out about wonderful books to read with your child. You will find many creative activities based on each book to make reading even more enjoyable and interactive. Contact lovemybooks using the contact form or email info@lovemybooks.co.uk.